Only 100 will be built for collectors. Bentley teased a new special edition model to celebrate the brand's 100th anniversary and now the limited run car has arrived. 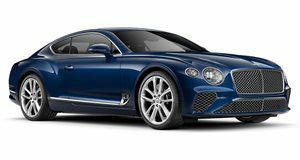 It's called the Continental GT Number 9 Edition by Mulliner and it is inspired by Bentley's 100-year motorsport heritage. Long-winded name aside, this Continental GT looks stunning in this shade of Viridian Green (customers can also order Beluga Black). The Number 9 Edition by Mulliner pays homage to Sir Henry Ralph Stanley ‘Tim’ Birkin, who was one of the original ‘Bentley Boys’ of the 1920s and ‘30s. Birkin was a Bentley customer, investor, and racecar driver who piloted the Number 9 Blower Bentley at the 1930 Le Mans 24 Hours. He also commissioned the production of a series of four and a half liter Bentleys with superchargers, which raised power up from 110 to 175 horsepower. The Continental is seen next to the Number Nine Blower Bentley Birkin piloted, which also wore an imposing shade of green. The Number 9 Edition by Mulliner is distinguished by model-specific badging, a number nine on the grille, and 10-spoke 21-inch wheels. It also features changes on the interior including Cumbrian Green or Beluga heritage leather and plenty of 'B' logos. Like the old racecar, the dash uses a unique turned aluminum spin and is adorned with an exclusive British Jaeger clock face. The Bentley Rotating Display has also been enhanced with an artifact from Birkin’s iconic 1930 Number Nine Le Mans racecar. It features a real wood insert, which was removed from the historic car during a restoration. You may also notice the 18K gold plated organ stops for the air vents, which are unique to the Number 9 Edition by Mulliner. As with other Continental GT models, the Number 9 Edition by Mulliner is powered by a 6.0-liter twin-turbo W12 producing 626 hp. The sprint to 60 mph takes just 3.6 seconds on the way to a 207 mph top speed. Only 100 examples will be built to celebrate the company's 100th anniversary, so be sure to get your order in before they are sold out.